The Philadelphia Eagles new 2013 Chip Kelly offense might end up putting them in the playoffs. 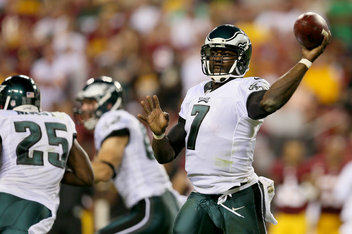 The Eagles defeated the division champion Redskins 33-27. In the first half the Eagles ran 53 offensive plays and scored 26 points. The score could have been 40 to 20, but the officials did not make a very good call on the Eagles' first drive. Michael Vick made a pass that was knocked down and picked up by the Redskins. It was ruled a lateral pass. LeSean 'Shady' McCoy and DeSean Jackson combined for 293 all purpose yards and a couple of touchdowns in the win.